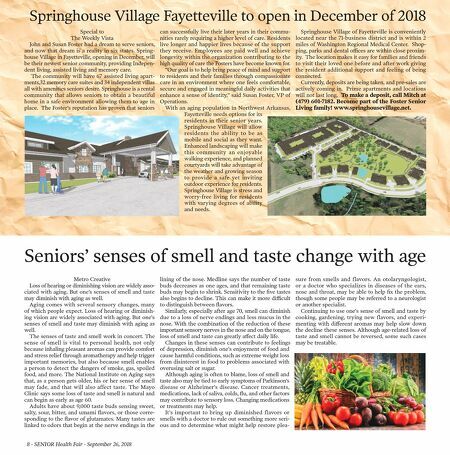 Springhouse Village Fayetteville to open in December of 2018 Special to The Weekly Vista John and Susan Foster had a dream to serve seniors, and now that dream is a reality in six states. Spring- house Village in Fayetteville, opening in December, will be their newest senior community, providing Indepen- dent living, assisted living and memory care. The community will have 67 assisted living apart- ments,32 memory care suites and 34 independent villas all with amenities seniors desire. Springhouse is a rental community that allows seniors to obtain a beautiful home in a safe environment allowing them to age in place. The Foster's reputation has proven that seniors can successfully live their later years in their commu- nities rarely requiring a higher level of care. Residents live longer and happier lives because of the support they receive. Employees are paid well and achieve longevity within the organization contributing to the high quality of care the Fosters have become known for. "Our goal is to help bring peace of mind and support to residents and their families through compassionate care in an environment where one feels comfortable, secure and engaged in meaningful daily activities that enhance a sense of identity," said Susan Foster, VP of Operations. With an aging population in Northwest Arkansas, Fayetteville needs options for its residents in their senior years. Springhouse Village will allow residents the ability to be as mobile and social as they want. Enhanced landscaping will make this community an enjoyable walking experience, and planned courtyards will take advantage of the weather and growing season to provide a safe yet inviting outdoor experience for residents. Springhouse Village is stress and worry-free living for residents with varying degrees of ability and needs. Springhouse Village of Fayetteville is conveniently located near the 71-business district and is within 2 miles of Washington Regional Medical Center. Shop- ping, parks and dental offices are within close proxim- ity. The location makes it easy for families and friends to visit their loved one before and after work giving the resident additional support and feeling of being connected. Currently, deposits are being taken, and pre-sales are actively coming in. Prime apartments and locations will not last long. To make a deposit, call Mitch at (479) 601-7182. Become part of the Foster Senior Living family! www.springhousevillage.net. 8 - SENIOR Health Fair - September 26, 2018 Seniors' senses of smell and taste change with age Metro Creative Loss of hearing or diminishing vision are widely asso- ciated with aging. But one's senses of smell and taste may diminish with aging as well. Aging comes with several sensory changes, many of which people expect. Loss of hearing or diminish- ing vision are widely associated with aging. But one's senses of smell and taste may diminish with aging as well. The senses of taste and smell work in concert. The sense of smell is vital to personal health, not only because inhaling pleasant aromas can provide comfort and stress relief through aromatherapy and help trigger important memories, but also because smell enables a person to detect the dangers of smoke, gas, spoiled food, and more. The National Institute on Aging says that, as a person gets older, his or her sense of smell may fade, and that will also affect taste. The Mayo Clinic says some loss of taste and smell is natural and can begin as early as age 60. Adults have about 9,000 taste buds sensing sweet, salty, sour, bitter, and umami flavors, or those corre- sponding to the flavor of glutamates. Many tastes are linked to odors that begin at the nerve endings in the lining of the nose. Medline says the number of taste buds decreases as one ages, and that remaining taste buds may begin to shrink. Sensitivity to the five tastes also begins to decline. This can make it more difficult to distinguish between flavors. Similarly, especially after age 70, smell can diminish due to a loss of nerve endings and less mucus in the nose. With the combination of the reduction of these important sensory nerves in the nose and on the tongue, loss of smell and taste can greatly affect daily life. Changes in these senses can contribute to feelings of depression, diminish one's enjoyment of food and cause harmful conditions, such as extreme weight loss from disinterest in food to problems associated with overusing salt or sugar. Although aging is often to blame, loss of smell and taste also may be tied to early symptoms of Parkinson's disease or Alzheimer's disease. Cancer treatments, medications, lack of saliva, colds, flu, and other factors may contribute to sensory loss. Changing medications or treatments may help. It's important to bring up diminished flavors or smells with a doctor to rule out something more seri- ous and to determine what might help restore plea- sure from smells and flavors. An otolaryngologist, or a doctor who specializes in diseases of the ears, nose and throat, may be able to help fix the problem, though some people may be referred to a neurologist or another specialist. Continuing to use one's sense of smell and taste by cooking, gardening, trying new flavors, and experi- menting with different aromas may help slow down the decline these senses. Although age-related loss of taste and smell cannot be reversed, some such cases may be treatable.